Tiredness really starting to take it's toll now and I struggled to drag myself out of bed and get ready, but I was in Epcot around 10.30 where we headed straight to The Seas with Nemo and friends, as always it was a walk on and we were heading to Sunshine Seasons for breakfast shortly after, not feeling too good today meant I also wasn't feeling too hungry so just grabbed a drink and something light, I spent most of the morning just sat down relaxing while my holiday partners did a few rides, I was just enjoying the breaks and trying to take it easy as I knew it was going to be a bit of a crazy night. Before long it was time for our Character spot FP+ which is always a favourite of mine as I love meeting my favourite two mice, Mickey and Minnie as wonderful as always and I think Minnie definitely approved of my outfit. Not feeling my best and knowing I didn't want to feel this rubbish for the party later, I decided to head back to the hotel so I could have a sleep. I got back around 1.30pm and grabbed some lunch at the food court before going straight back to my room and the next think I knew, I was waking up and it was gone 3.30pm. I jumped up in a panic as I wanted to be at Magic Kingdom for 4.30 which looked extremely unlikely as I needed to sort my hair and makeup out plus get dressed, get my 2nd outfit together and everything else I needed, due to lack of time I quickly did my basic makeup rather than something a bit more out there I had planned and was thankfully walking into Magic Kingdom by 4.45pm, I got my MNSSHP wristband, took a few photos and headed straight to the reason I was adamant I had to be in the park by 5pm - the queue for 7 Dwarfs. It's been an absolute dream of mine to meet them for years now, especially as a group together and after missing out last year it was my priority this year, I'd even worn a separate outfit for the occasion and knowing how busy the line gets for them, I knew to get in it early, once I arrived at their spot not long after 5pm the line wasn't open but a queue had formed just outside of it and I was about 20th in it, the meet & greet area was set up shortly after and about 30 minutes later we were let in the proper queue (at this point I realised in my hurry I'd forgot to use the handbag I'd brought with me for this outfit, my 7 Dwarfs Danielle Nichole one) and didn't wait too much longer. They were absolutely amazing and although a quick meet (the queue was huge by this point) it was worth every minute of waiting which only happened to be about an hour in the end, not bad at all. All important task done, it was time to get changed into my proper party outfit which I loved and was put together with the help of Ears Ever After and Luby & Lola and meet up with my sister & brother in law, my sister had text to say they were on Small World so I headed over that way and as I headed into the Tangled toilets to get changed I actually bumped into them, a few moments later and new outfit on, it was time to fully enjoy the party. First stop was Main Street, I wanted to get some outfit photos with the castle backdrop before it got too dark, once important shots were taken we were going to head on to Space Mountain as the queue was short but realising it probably wasn't the best idea in our tutu's, unless we wanted to flash a number of people which we didn't fancy doing, instead we opted for our first trick or treat stop in Tomorrowland and started to hit them all up on our way walking around the park anti clockwise, my sister really fancied riding teacups and not wanting her to do it alone, I plucked up the courage and just did it, instantly regretting it after the first couple of spins but thankfully it was soon over, we then headed further into Fantasyland picking up as much candy from every station we went past, this is one of my favourite part of the MNSSHP party. At the back of the castle we happened to bump into Anastasia and Drizella, now after bad luck after bad luck attempting to meet these ugly step sisters on this years earlier WDW trip and also my Disneyland trip I was really excited by this and finally got a photo with them, they were so much fun. A 15 minute queue for Seven Dwarfs Mine Train meant that was our next stop and we then continued our walk around the park collecting more and more sweets, as the night went on the handfuls got bigger and the bag was getting full and also stopping for as many of the magic photos shops as possible. It was now getting near 10pm and of course we wanted to watch Hallowishes, so headed to Main Street to grab a Starbucks and watched from just outside as that's how far the crowd had built up at this point, in fact it was the same place we watched last year but thankfully it was a lot dryer this year, it's such a great firework show and even though I'm not a big villain fan, in fact I'd say I'm not a fan of them really at all, I still love this. Fireworks over, we made our way over to meet Minnie, Daisy & Donald and hoped the queue wasn't too long as we only had about 25 minutes till the parade, unfortunately by the time we'd met Minnie we just didn't have time for Daisy & Donald which I was pretty gutted about but we couldn't not watch Boo to you parade, it's such a good one, instead of watching from Main Street or around the castle we opted to watch Liberty Square, we made our way from Fantasyland to hopefully get a good spot, stopping for more candy on the way and a photo holding the Tangled lantern, we found a spot right at the front opposite The Diamond Horseshoe and it ended up being a pretty good spot, I've only ever watched any Magic Kingdom parade from Main Street but I'd really recommend this spot especially for Boo to you. 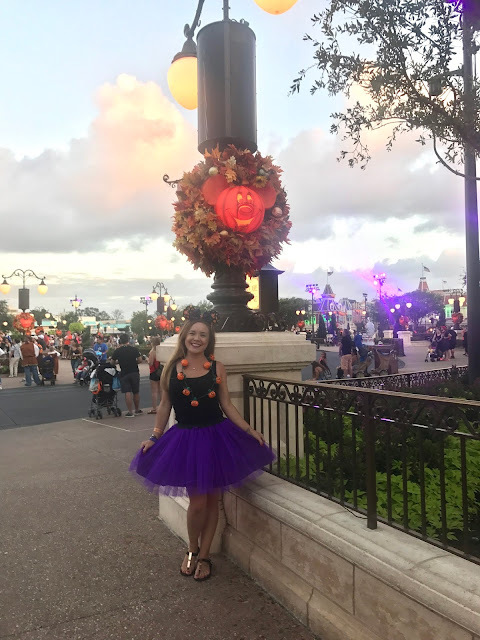 Once the parade was over we hung around for a bit and then made our way to the castle to watch the last Hocus Pocus Villain show of the evening, as well as the headless horseman, this was another thing we missed out on last year so was a must do this time. It was really good an considering it's villain based, I really enjoyed it. Most of the crowd leave once the fireworks are done but the remaining few started to head out after the last Hocus Pocus show which is the end of the party, we decided to grab a bench and sit down for a bit as I knew trying to get out with the rest of the crowd is no fun, my sister & brother in law left about 15 minutes later but I decided to hang around a little longer to get those empty Main Street/Castle photos and got lucky, there's not a single person in my photo :) photo achieved, I made my way out the park and to the bus stop, feeling extremely exhausted and very much ready for bed, it had been such a great evening though so it was all worth it. Finally back at the hotel sometime after 1am, I showered and fell straight into bed and asleep within minutes.